Former British number one Laura Robson will miss this month's French Open as her 16-month injury lay-off continues. Robson, 21, had wrist surgery 13 months ago and has not played since the 2014 Australian Open. She initially used her protected ranking to gain direct entry into Roland Garros, which begins on 24 May. However, Robson is now understood to be exploring the possibility of returning in one of the British grass-court events before Wimbledon. 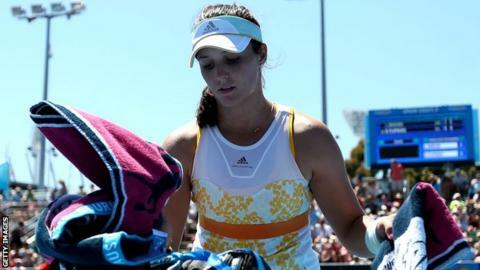 Robson reached a career-high ranking of 27 in the world in July 2013, but since then she has struggled with problems in both of her wrists. She no longer has a world ranking but will be able to enter eight WTA tournaments under a protected ranking of 58 - her position in the standings when she last played. The 2008 Wimbledon junior champion will also be able to take up any wildcards offered by tournaments.